Beam Up Your Own Star Trek Light Switch Covers | OhGizmo! By Chris Scott Barr on 11/13/08 • Leave a comment! I’m a Star Wars guy, but my love of Sci-Fi lets me understand why others are such fans of Star Trek. I carry my lightsaber, you have your pointy ears. 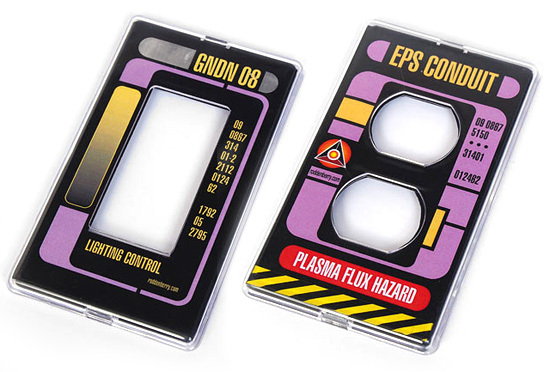 Well, for those Trekkies out there that want to make their home just a little more like the USS Enterprise, here are a couple of face plates that might help you out. There are three different plates, which really do look like something you’d expect to see on the Enterprise. One is for your standard electrical outlets, another for a regular light switch and a third for a light switch dimmer. Each one of these 24th-century plates will set you back $18.